The brilliance of Arizal shines once again with this wildly fun and entertaining outing. All of Arizal’s films are absolutely great, even priceless; it’s our contention that it’s only because none of his films got U.S. distribution during the golden age of the video store that he isn’t a household name like so many other directors. Because their movies could be found in video stores, so-called “cult” directors like Russ Meyer, David Lynch, and John Waters, as well as the horror contingent big names like Romero/Carpenter/Craven, are just some of the directors that are in the public consciousness. Or at least they are among film and video freaks. Fact: Arizal deserves to be among them in the pantheon of great cult directors. Maybe with time, that will occur. We’ll do our small part to shine a light on his highly impressive body of work. Now we’ll get off our soapbox. The plot, which is quite simple to provide plenty of space for action, concerns rival factions vying for a much sought-after piece of microfilm. At least it’s not the time-honored “disc” so many people in these movies are looking for, but we can’t remember a time when anyone ever wanted a microfiche. But we digress. Jake Carver (Mitchum) wants the microfilm, so he travels to Indonesia. But Adam (Superfoot) and his henchman Frank (Abbott) also want it. A man named Hope Seleck (O’Brian, The Stabilizer himself) also wants it and he feels the wrath of Jake. So the baddies kidnap Jake’s girlfriend Janet (Iasha, like O’Brian a veteran of another Arizal movie, in her case Final Score) and all hell breaks loose. Shooting, stunts, fights, helicopter chases, cars flipping over and blow-ups galore ensue. 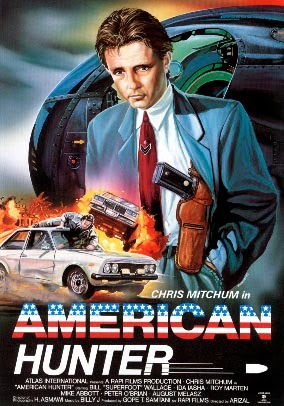 Will one of the baddies be an American hunter, or will Chris Mitchum be an American Hunter? Definitely find out today! Right now! Much like Arizal’s ability to create impressive action on a rock-bottom budget, our love for him knows no limits. The movie just STARTS - we’re thrown in the pool and left to swim right from the first second, almost Godfrey Ho style (Abbott was a Ho mainstay). But would you want it any other way? But you can tell it’s Arizal bein’ Arizal right from the jump. The amusement of the audience never lets up (isn’t that what cinematic entertainment is all about? ), and you never have to wait long for action. At the very least, there will be a silly punch-up or two just to remind you who’s boss. Chris Mitchum is once again at his best, taking down hordes of Asians with his Martial Arts ability, all while in a leisure suit. Well, when he’s not in a stonewashed jean jacket, that is. Who else but Mitchum could master the art of the “nonchalant backflip”? Naturally, there’s the Prerequisite Torture of the hero, but this time it’s better than usual. His nemesis, Superfoot, is also at his best here. His acting is almost John Miller-esque, though, to be fair, no one could really scale the heights of Mr. Miller. Clearly Mitchum vs. Superfoot is the true clash of the titans, and if you want to see what happens, just watch this fast-paced, enjoyable and fun outing. There’s no excuse to miss it. Arizal should be counted as one of the preeminent action filmmakers of his day, and American Hunter is just more proof that his talent is not a one-film accident. American Hunter seals the fact that his star should be in the moviemaking firmament with the greats. Just curious, how did you see this film? We saw it on Youtube. Not sure if's it still there. This is an awesome movie from beginning to end. The action kicks off with a jeep crashing through a second-story window and never lets up. Another winner for the great Rapi Films! Been meaning to check this out! Saw The Stabilizer recently and loved it. Great reviews guys! Thanks! If you loved The Stabilizer, you will enjoy this one immensely.